Some pedals – particularly of the simpler overdrive/distortion/booster kind – tend to sound different when their outputs only ”see” a cable straight to the amp, compared to when you kick in a pedal after them. The overdrive/distortion is often described as becoming brighter and louder when there’s another pedal following it. The Fulltone OCD (up to version 1.7) and Lovepedal Eternity are two pedals often mentioned in this regard, although there are far more of this type around. The ”problem” is that their outputs are unbuffered – I say ”problem” because that will only be a problem under certain circumstances. 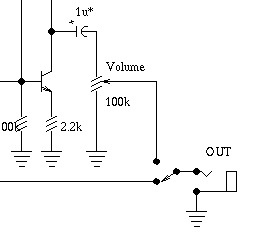 Basically, their output is taken straight from the output volume pot – as the pic to the right (a cutout from the schematic for a Big Muff Pi) indicates. This means they will have a higher than normal output impedance. When all they see is a cable to the amp, that cable will become part of the sound (just like the guitar->pedalboard cable has an effect on the tone when you’re using regular passive/high impedance pickups). When you kick in your delay (or what have you) pedal after it, the long cable disappears, making the overdrive pedal sound louder and brighter (again, just like your guitar does if you were to connect it to the amp with just 1 foot of cable). This behaviour is directly linked to the advent of pedals wired for true bypass – if all you had was Boss/Ibanez style pedals, you wouldn’t notice any particular change when you switch the delay on/off (since its buffer stages are always present, pedal on or not). True bypass means the whole circuit is inserted into the chain when the pedal is on, and removed from it when it’s off. The upside is that the signal chain is kept as short as possible, but the downside is that bringing stuff in/out like that can change how other pedals react. This is not a true bypass pro/con article – you can read those elsewhere on the site – but I felt it needed mentioning. Before we move on, this term might need an explanation. I wrote in the ”Do I need a buffer?” article that all active circuits conceptually do the job of a buffer, so what is an ”unbuffered” effect? Most effects – true bypass or otherwise – have buffer stages at the circuit start and finish, to help them stay independent of other pedals in the chain. The circuit is cushioned between the input and output buffer, giving it a consistent work environment. An unbuffered effect doesn’t have that protection, which is why it can change its tone depending on what’s around it. And – as is often the case with simple overdrive/distortion/boost pedals – if the output is taken straight from the output volume pot, the output impedance of the circuit will vary with the volume pot setting. It’s quite simple. Adding a buffer stage inside the pedal, between the circuit output and the switch, would do the trick. But modding is not always an option. In those cases, you can just make sure there’s a buffer (buffered or otherwise active pedal or standalone buffer) right after the offending pedal. The tone will stay consistent, and you can then adjust the settings to suit. But doesn’t that make the whole true bypass thing useless? I promised this wouldn’t be another of those articles, but let me digress slightly. No – the fact that you can solve problems by careful positioning of one buffer stage does not negate the benefits of a mostly true bypass chain. As I wrote near the end of the main true bypass article, you’re best off having as few buffer stages as possible in the chain. Yes, you can have only fully buffered pedals if you like, and you won’t have any matching problems like we’ve discussed here. But you may find the resulting clean tone slightly lacking. I find the best results come when I use buffers where they will perform a vital function, and keep the rest true bypass. The idea is not to have absolutely everything true bypass (as that will introduce cable loading whenever you turn all those pedals off). The idea is to have as short a signal path as possible at any given time. This means having as few buffer stages as possible, while carefully positioning the ones you have.